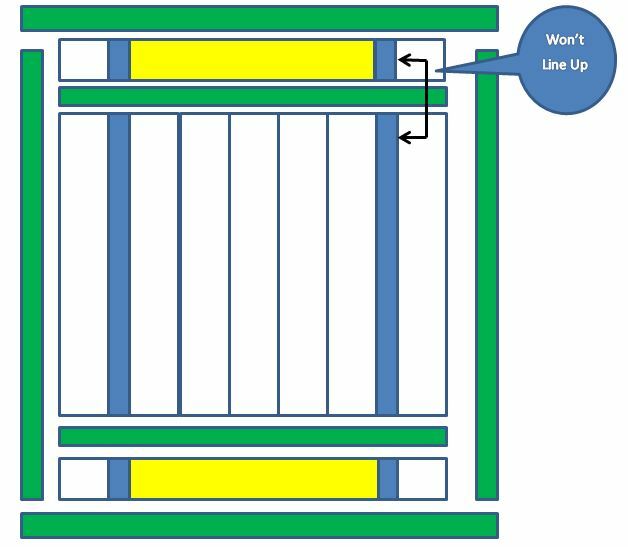 Using a Quilt Ruler – do you know they can slip? I can now state that sewing doll clothes did not prepare me for quilting. None the less I was very sure I could do this. I found a free, very simple pattern (which actually had applique but I left that off), and was confident I would succeed making this quilt. I’m sure I can figure it out. Piece of cake, right? I did just enough prior research to know I could fold my fabric in half, selvage to selvage, and use a ruler and rotary cutter to cut my strips. What I didn’t understand was the proper way to hold down the ruler to prevent it from slipping. I thought if I pressed down hard enough, right in the middle, I could cut my entire strip. Not so. The ruler slipped at either the beginning (bottom) or end (top). I only ruined two strips before I figured out what to do. Correct Method: Place your hand towards the bottom and cut part of the way, then reposition your hand towards the top and finish cutting. I’m glad I bought extra fabric. If you don’t sew your seams consistently any strips that were supposed to look lined up actually look wonky, as mine definitely did! Even with a strip running between them. TIP: Get a ¼” foot for your machine if at all possible. If there isn’t one available, use a ruler to measure a ¼” from your needle and tape blue painter’s tape on your machine bed to mark a line to follow. The painter’s tape will not leave a residue when removed. Who would have guessed that there were so many different types of batting available and that each type dictated how close your quilting should/could be! It’s a good thing I read labels. Since I had never quilted anything before I didn’t realize how important it was to know these differences. I found a Bamboo blend batting (Fairfield Nature-Fil, 50% Bamboo/50% Cotton) that was very soft and allowed quilting up to 8”. I had no idea yet how I would quilt this so I wanted as much room as possible. I love using this batting. It does not seem to shed as much as cotton batting while I’m quilting. Here is a link to the Fairfield website for more information http://www.fairfieldworld.com/products. I had a lot to learn at this point. I knew I had to do something to keep the layers together so I stitched in the ditch on every seam then did a few rows of straight lines of stitching from one side to the other. I also ran two diagonal lines of straight stitching through the entire quilt to form a big X and sewed diagonal lines in the four corner squares. Very basic but it was fine for my first quilt. I did not sew a binding on this quilt but instead folded extra length of backing up over the edges, folded it under for a clean edge and sewed it down. As I learned more about binding I’ll be adding that in future posts. That was it! I was so proud that I survived the effort and the quilt wasn’t horrible. I couldn’t wait to tackle more projects and continue to learn. 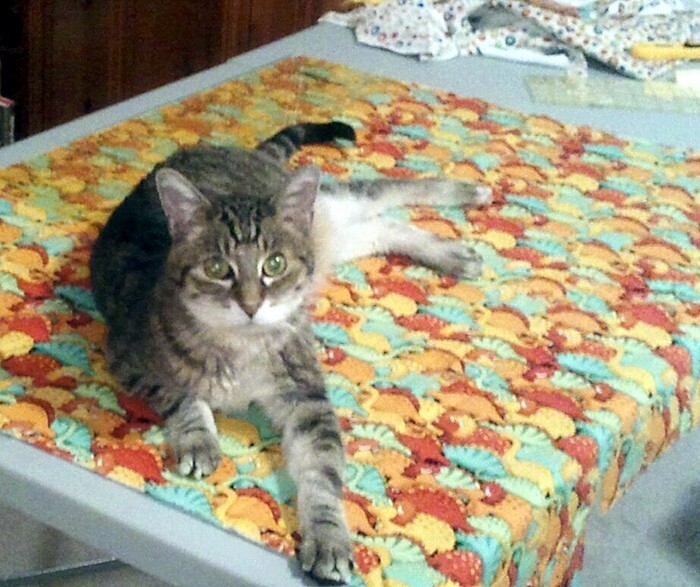 One more lesson learned; cats like to help you quilt. Thank you for your help it’s generous and kind your ideas are creative, love your cat! Thank you Mary. I haven’t had time to quilt in quite a while, but will eventually be adding more to my blog. I have improved somewhat since then, so now I call myself a confident beginner rather than just a beginner, LOL. Denise, You have a very cute blog. It is very interesting to read as you mention a lot of the struggles we all had when we began, but we have now forgotten about. Good luck on your future pattern publishing. It is a lot of fun. Here is to many happy quilting days in the coming year! Thanks Michelle! You have fun projects on your site. Once I get a few more quilts under my belt I may try other things as well!